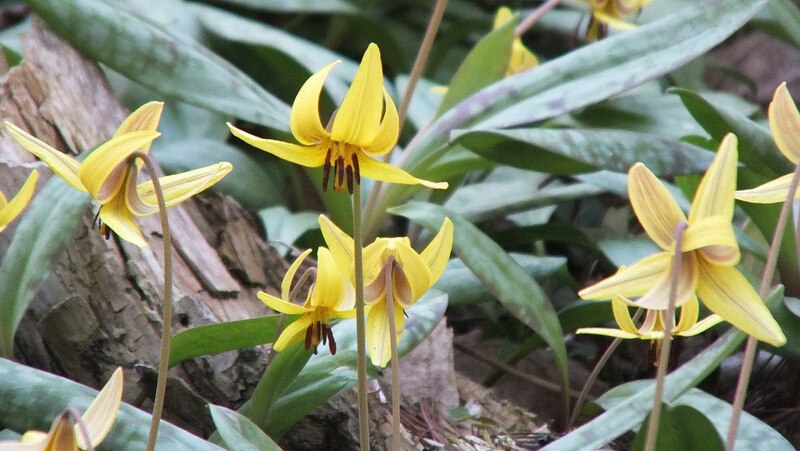 On a warm sunny spring day, Bob and I visited Thickson’s Woods Nature Reserve in Whitby, Ontario. We most often explore the trails of the forest, hoping to find some migrating birds, but on this visit, we opted for a walkabout the meadow adjacent to the woodlot. 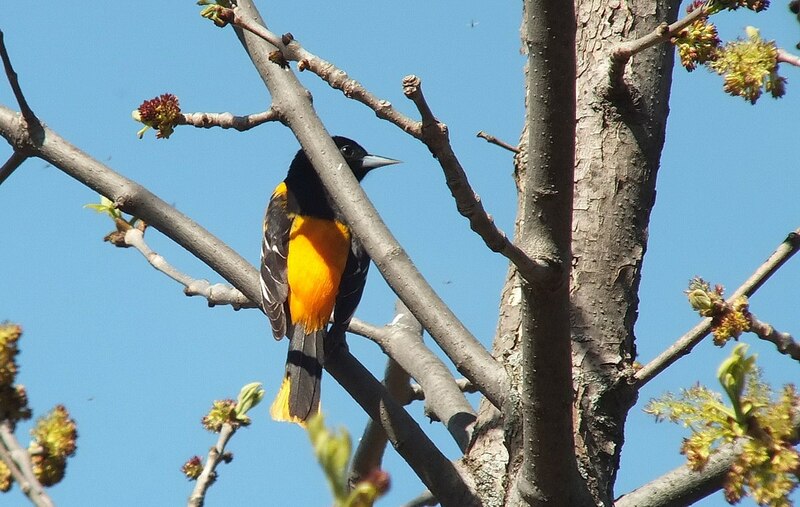 What a perfect habitat for the many species of songbirds that we saw that day, amongst them a beautiful Baltimore Oriole. Bob and I had no sooner stepped through the row of evergreen trees into the meadow than we came face to face with a Cottontail Rabbit. 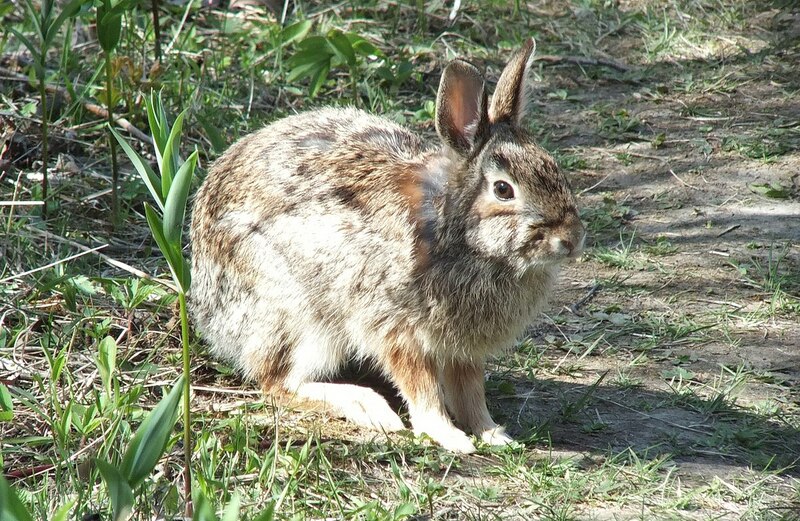 Its fur had almost completely changed to full summer colour, so the rabbit blended in well with the dirt path. I was so taken with the rabbit that I nearly missed the Baltimore Oriole when it landed in a tree a stone’s throw away. Bob and I were lucky that the tree had not yet burst into full leaf cover. 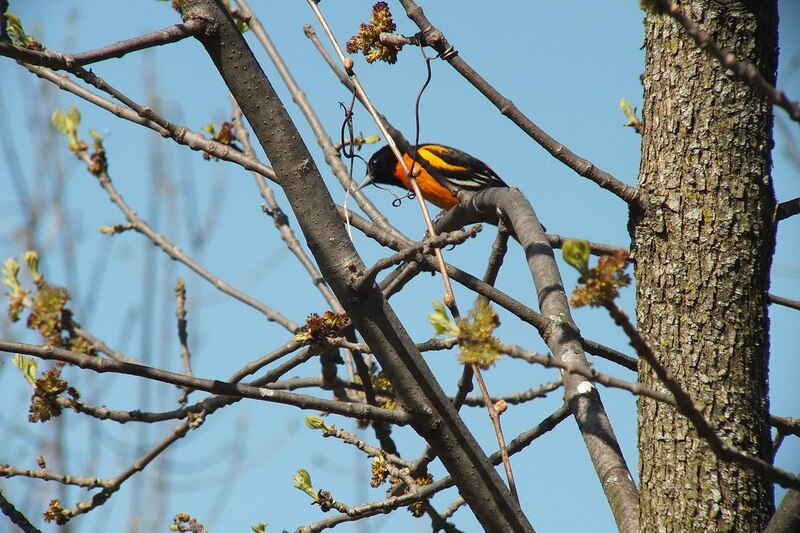 Instead, we had a good view of the striking rich orange plumage of the male Baltimore Oriole. The feathers on its head looked like black velvet. Baltimore Orioles are members of the blackbird family of birds, and one good indication of that is their long, thick-based, pointed bills. 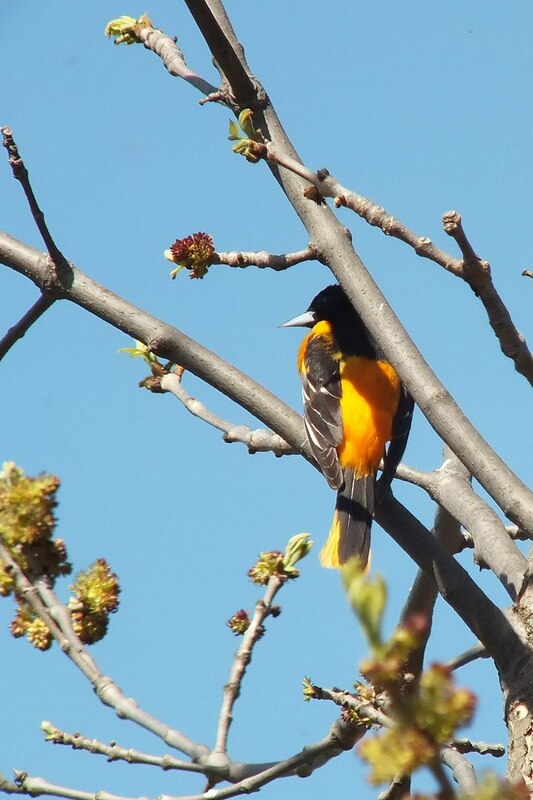 Baltimore Orioles are most often seen high in the tree tops where they forage for insects, but they also have a penchant for flowers and fruit. These birds prefer open deciduous woodland and often they choose a location at the forest’s edge or in an orchard, and usually near a source of water. The meadow where we found this oriole actually includes portions of an old orchard, and is adjacent to a wetland, so it seems like the perfect spot for the bird to take up residence. In this photo, the white wing bars really stand out against the primarily black wing. 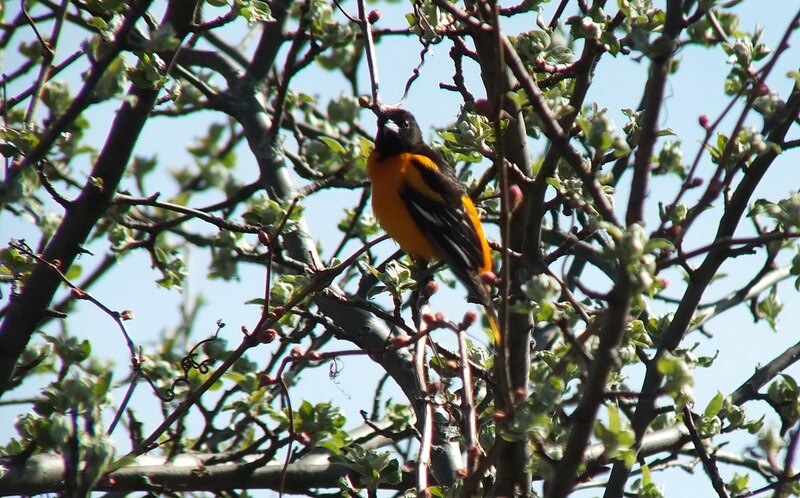 This oriole spent a good deal of time scouring the branches of the tree in search of insects. 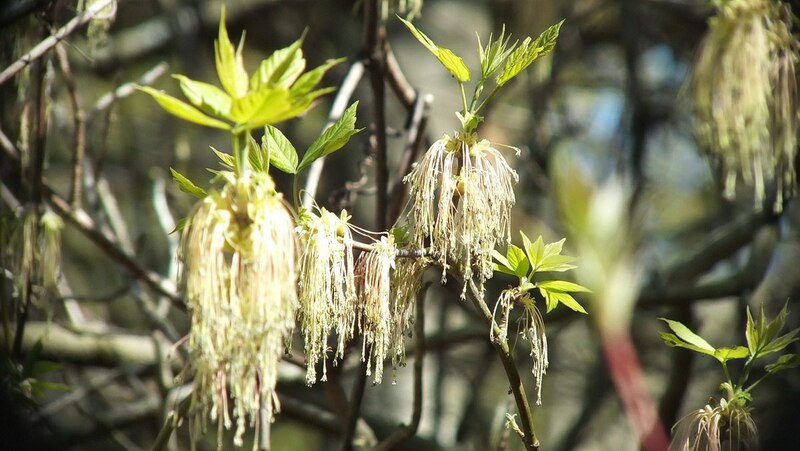 It acrobatically clambered, hovered and hung amongst the thin branches. 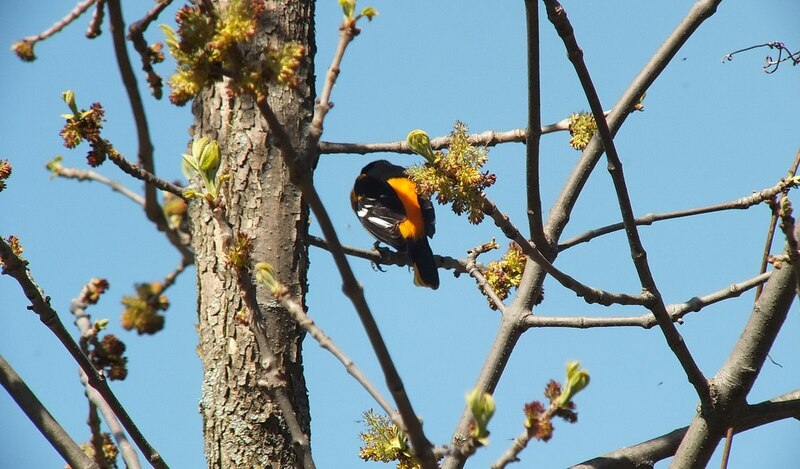 Although we didn’t catch sight of the female oriole, we are pretty sure that the pair will be building a nest in the vicinity. 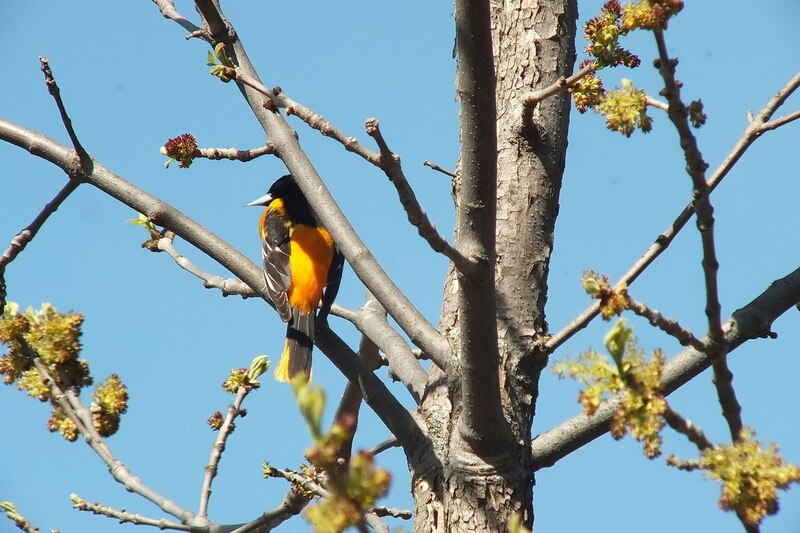 Last winter, we noticed the sac-like nest of a Baltimore Oriole suspended from the end of a high branch at the edge of Thickson’s Woods. The nest is a skillfully woven structure of plant fibres, hair and twine. It is durable and may remain intact for several years. 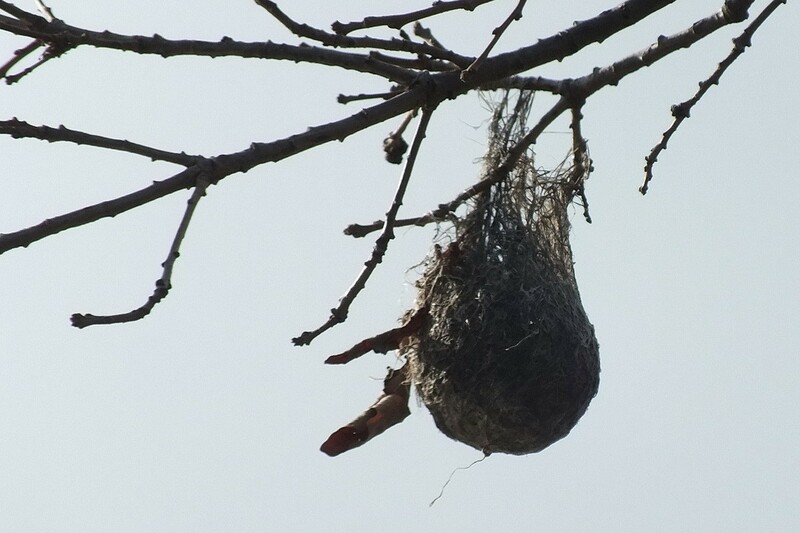 On second thought, maybe the orioles will use the same nest once again. 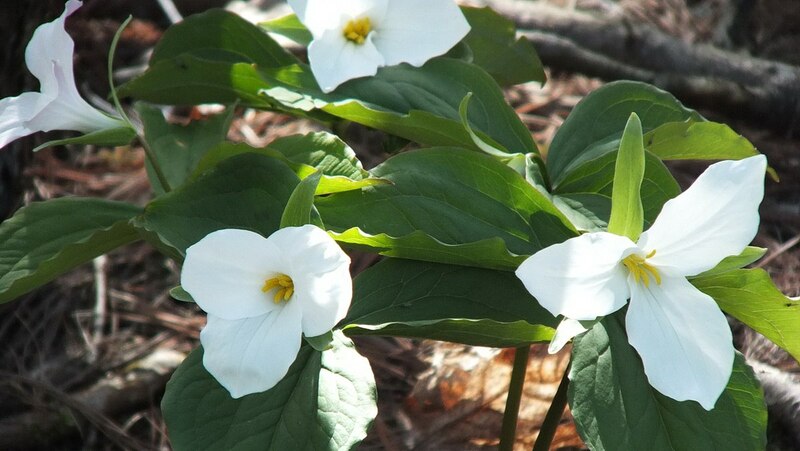 and small stands of White Trilliums brightened the forest floor. 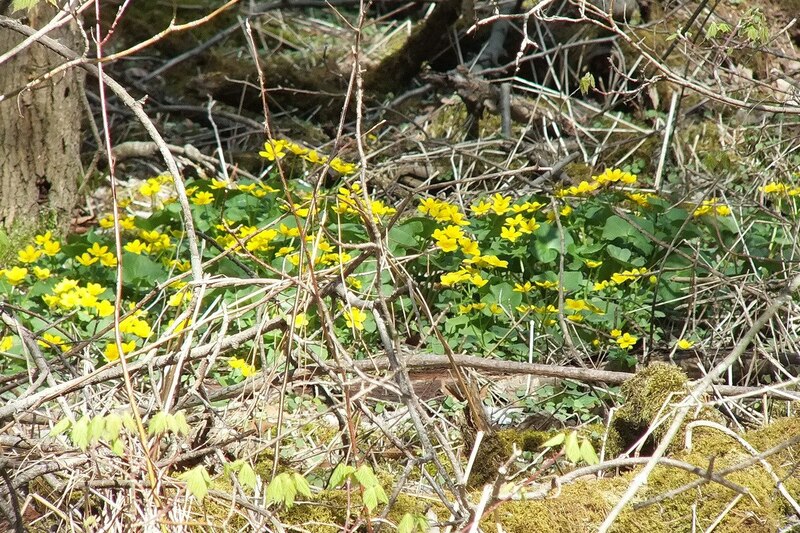 In a damp hollow, sprawling masses of Marsh Marigolds had taken hold, and the brilliantly yellow blooms were like a beacon when glimpsed through the profuse growth of new leaves and the tangle of brush. Back in the meadow, Bob and I were treading lightly in search of more migratory birds. 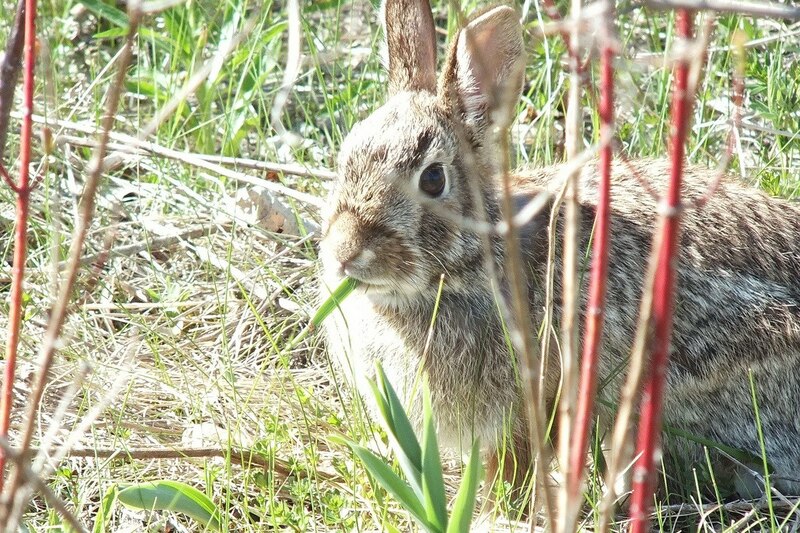 There are a number of intersecting trails that crisscross the area, and while exploring, we saw no less than four Cottontail Rabbits, some of them munching on the fresh green grass. 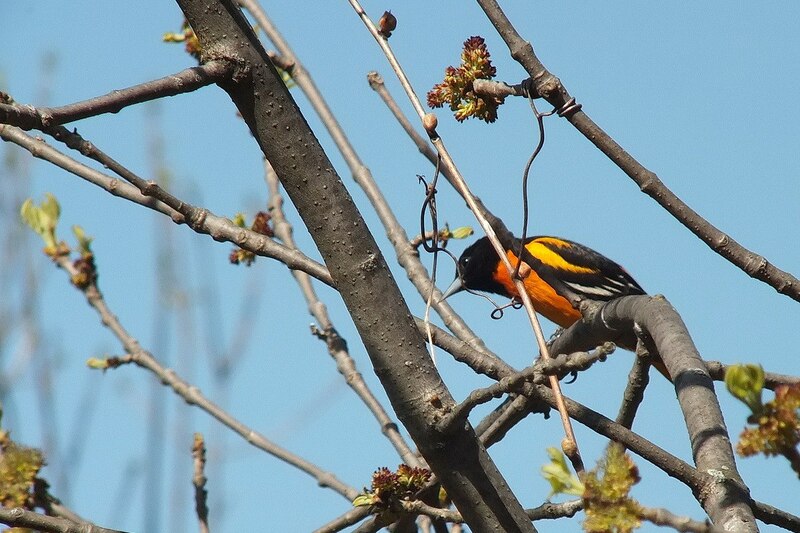 In amongst the apple trees that once were part of an orchard, a Baltimore Oriole sang its heart out. Bob and I thoroughly enjoyed our afternoon of bird watching, but, as usual, we ended up spending far more time than intended. It is a blissful activity.